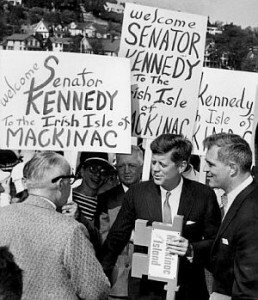 JFK was in Mackinac Island, Michigan, where a sign-carrying crowd of Islanders welcomed him. He was introduced by Michigan Governor Williams. JFK being introduced to crowd in Mackinac, Michigan.